We offer an optimized approach to electronics recycling close to where you are in Folsom, California. Let All Green help you with our globally recognized IT Asset Disposition Services. 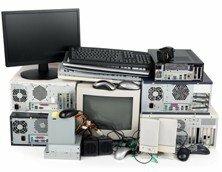 Having a trusted service provider for your electronics recycling needs is crucial. Our Folsom Electronics Recycling is reliable and credible. We develop an IT Asset Disposition system that suits our clients' different needs. We do equipment packing and proper disposal of IT assets. The protection of confidential company information is our top priority. We help businesses reduce the risk of data breach and leaking. We offer the best hard drive shredding, data wiping, media degaussing and media shredding services. With us, your business brand is safe. Folsom City boosts of its 32-mile bike trail. The Folsom Lake Recreational Area is also favorite destination of nature-lovers who do off-road biking or hike on trails that are surrounded by trees, wildlife and vegetation. Would you risk destruction of these natural beauties? Residents who value life and their surroundings would opt for a safe and secured e-waste disposal system that is being offered by All Green’s Electronics Recycling Folsom Services. Every business is faced with the challenge of ensuring roper disposal of electronic wastes. This is a concern that is shared by business operating in the US and other parts of the world. But the challenge does not end there. A bigger challenge is the selection of a reliable service provider who will handle your e-wastes with the aim of protecting your business interests and the community where you belong. This is where our premium-class electronics recycling comes into play. We are close to where you are in Folsom. Trust us and your satisfaction will be guaranteed. Our goal to is ensure the recovery of end-of-life assets for a wide range of electronic wastes. We handle gadgets, appliances and even medical equipment. While we recycle e-wastes, we also bare in mind the need to generate returns from still useful items that we extract from the electronic equipment that you entrust to us. Do not hesitate. We promise to give you only the best quality service that you truly deserve. We use All Green’s custom -built trucks for on-site hard drive shredding. Our personnel and equipment are sent to where you are so you will no longer have to endure the hassle of having to transport your electronic equipment. Data destruction right at your door step will also allow you to observe the entire process so you can be assured that everything that we do is safe and secured. We do everything right because we value your security. Contact us now for your free quotes.